Rock Run Industries’ Prima Power 2.0 fiber laser with a 10-shelf tower. The compact tower server allows for easy loading and unloading of blanks and processed sheets. North American recreational-vehicle (RV) shipments hit their highest level ever in 2017 (472,200 units), according to the Recreation Vehicle Industry Association, marking the industry's eighth consecutive year of gains. Those shipments should grow even more in 2018, according to the group. That is great news for Rock Run Industries, LLC, Millersburg, IN, a manufacturer of RV parts (waste-tank supports and chassis-prep components) for more than 150 RV OEM plants. Located near Elkhart, IN, known as the RV Capital of the World, Fritz Schlabach founded the company in 2007 after quitting his full-time job as a plumber in the mobile-home industry and purchasing an old punch press and other used equipment. Today, Rock Run, with its 51 employees and 84,000-sq.-ft. fabrication facility with powder-coating capabilities, is riding the RV wave, having doubled its sales since 2013. It also has expanded its production capabilities to include outdoor kitchen cabinetry that utilizes galvannealed steel for the countertops and doors. Until recently, Rock Run outsourced the production of this product. 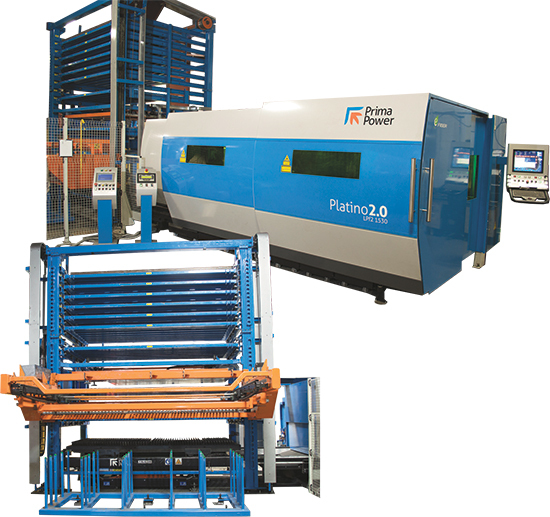 That changed, he says, when Rock Run purchased a Platino 2.0 fiber laser with 10-shelf tower from Prima Power, Schaumburg, IL, which in 2015 supplied Rock Run with an E6x servo-electric turret punch press. 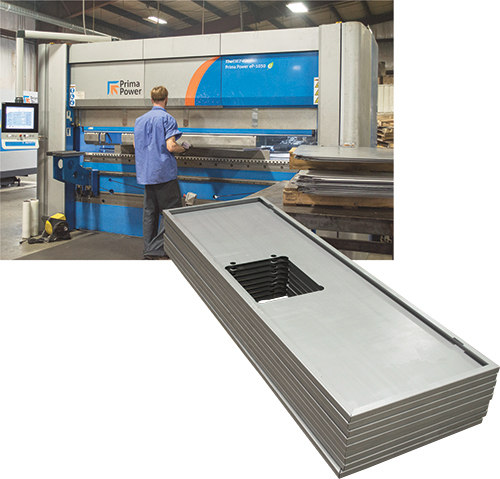 This Prima Power eP press brake eliminates upper-beam deflection under load while also eliminating the need for bed crowning. The closed frame eliminates side-housing deflection, a common occurrence with c-frame designs. Rock Run uses the fiber laser and compact tower it acquired in March 2016 to cut a range of steels and aluminum, including highly reflective materials of various thicknesses (11 to 16 gauge) for its RV products as well as the 16-gauge galvannealed steel for its outdoor kitchen cabinetry. Rock Run also benefits from the 10-shelf tower for loading and unloading blanks and processed sheets. The tower has an elevator for loading and unloading the pallets on and off the tower, and features single-sheet separating and sheet reference. In addition, because the machine is fully independent, it is suitable for lights-out operation. Once programmed, the fiber laser automatically manages settings, tip replacement, sheet change and storage, etc. Also in 2016, Rock Run Industries installed the Prima Power eP servo-electric press brake. The high-precision brake’s design, based on the company’s experience in press brakes and servo-electric machine tools in the metalworking industry, reportedly reduces operating costs, increases productivity and reduces setup time. Side-housing deflection, common with C-frame designs. Its servo-electric drives evenly distribute bending forces in the upper beam for improved bending accuracy, increased productivity, lower operating costs, high reliability and fewer maintenance requirements. Following FABTECH 2017 in Chicago in November, Rock Run added the Prima Power BCe Smart 220 panel bender for producing small volumes, kits of components and individual parts calling for high-quality bends and high repeatability. Also, the servo-electric actuators reduce energy consumption and maintenance costs. See also: Prima Power North America, Inc.